We were so delighted to have the opportunity to curate a special Vintage Emporium for the Melbourne AW14 Finders Keepers market! 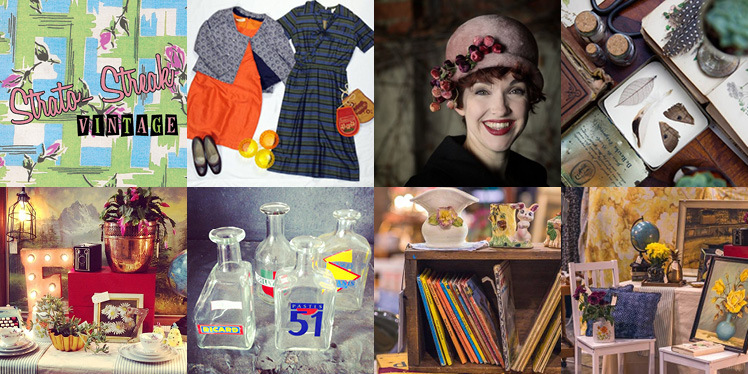 To get you in the mood for some retro delights, here are our top picks for vintage fashion, accessories and homewares sellers, who will have the best pieces from their impressive vintage collections on display for you to browse and of course buy. Lucky for you! You can find all of the sellers listed below in our Vintage Emporium, along side our art & design stalls, Farmers Lane, workshops and live music at our Melbourne AW14 markets on the 25th & 26th July at the Royal Exhibition Building in Carlton, Victoria. Bleecker Street specialises in vintage frocks, knits & blouses, plus goodies for the home with a vintage twist. Our vintage is re worked to for ladies who like a modern look, but want to be unique. In 2104 we are planning to release our own line of vintage inspired clothes, so stay tuned! Charlie Foxtrot offers stunning restored and working typewriters from the classic glass topped key models of the 1930’s to the industrial war time machines of the 1940’s, through to the Mad Men styles of the 50’s and the bright coloured retro typewriters of the 70’s. Added to this is a range of antique wooden letterpress printing blocks, vintage cameras, cuff links and jewellery. We offer items that are striking, timeless and quirky, all carefully hand picked for a new life in a different era. We are lovers of all kinds of hidden treasures, try to shine an inspiring light on up-cycling, and encourage imagination and expression through daily fashion. Come see our wares at The Finders Keepers Melbourne for a little treat of men and ladies vintage. I Love Lucy Vintage is an eclectic accumulation of a lifetime’s worth of scouring far and wide for vintage and retro treasures. I Love Lucy stocks the best of yesteryear; homewares, toys, furniture, memorabilia and collectables spanning the mid-century to the 1980’s. With a particular love for pieces from her childhood growing up in Melbourne, you might just rediscover fond memories of your own at I Love Lucy Vintage. Volcano Vintage, who will be sharing a space with I Love Lucy Vintage, specalises in high quality, hand made and hard to find vintage wares. I Love You Again is an online vintage store filled with beautiful dresses, skirts and a healthy dose of homewares and accessories. Based out of Melbourne, Australia, our range of products are sourced both locally and internationally, with products dating from the 1940s through to the 1980s. Kate & Rose has a mix of vintage, and vintage inspired products. The theme is High Tea Party, whether that be whimsical or in celebration of a bride to be, a baby shower or a get together with the girls. Vintage plates are up cycled into cake stands. Soy candles are set in vintage teacups, new vintage style apothecary containers, Ball Mason Jars and more. There is also a great range of new tea party inspired jewellery – from resin donut earrings and cupcakes to miniature china teacups, cake plates, teapots and more on necklaces. Broken vintage china is up cycled into necklaces and brooches. There’s something old and new for everyone. Bringing the past artfully into the present with exquisite jewellery designs fashioned from long-forgotten treasures. Dedicated to the art of assemblage design, Melbourne artisan Melanie Dooley transforms French and European antique and vintage jewellery into wearable heirlooms for today. Her creations combine beautiful and unique sentimental keepsakes with gemstones, pearls, beads and chain to create wearable works of art. Melanie’s designs are collected by customers from around the world and also in Australia. Take a step back in time at L’Atelier de Talaru. Photographer Mandy Lamont, who is based in Jindabyne in the Australian Snowy Mountains using found vintage objects such as Singer sewing machine drawers to create beautiful lightboxes featuring her photography. Marci vintage sources premium quality vintage from around the world to offer our customers unique, feminine pieces with a modern twist. We have a huge range of stunning one of a kind re-worked Japanese vintage dresses, gorgeous lace blouses as well as a vintage denim from the states. Marci vintage is all about unique vintage fabrics and romantic florals and lace. Based in Fitzroy North, Muscrats store stocks vintage clothing and accessories alongside a mix of new Australian made and designed home wares, lifestyle products and jewellery. Founded by two sisters who love travel and style, each collection is carefully selected to reflect current trends and is sourced globally to find the very best products. I have been up-cycling furniture for a number of years. For myself, family and friends. It is a passion, and I love the whole process involved. From the discovery, to the unveiling. I use a variety of different techniques to bring vintage furniture alive once more. Paint, wallpaper, stencilling, anything I feel would do a vintage piece justice. I love working on children’s furniture. Giving a tired, dark brown piece, an update with bright colours is so wonderful. Keeping the furniture out of landfill, and keeping the history alive is such a great feeling. At Sklep, we have fallen in love with vintage Polish poster design! We have a collection of hundreds of unique, original film, propaganda and social commentary posters from 1950s-60s-70s Poland, and each one is more colourful and interesting than the next. Strato- Streak Vintage offer original vintage and retro collectables from the 1950’s and 1960’s. We specialise in magazines, dress patterns, fabrics, homewares, kitchenalia, clothing & accessories. The Cavern Table Shop is a home to restored furniture, vintage fashion and collectibles and local artisan works. 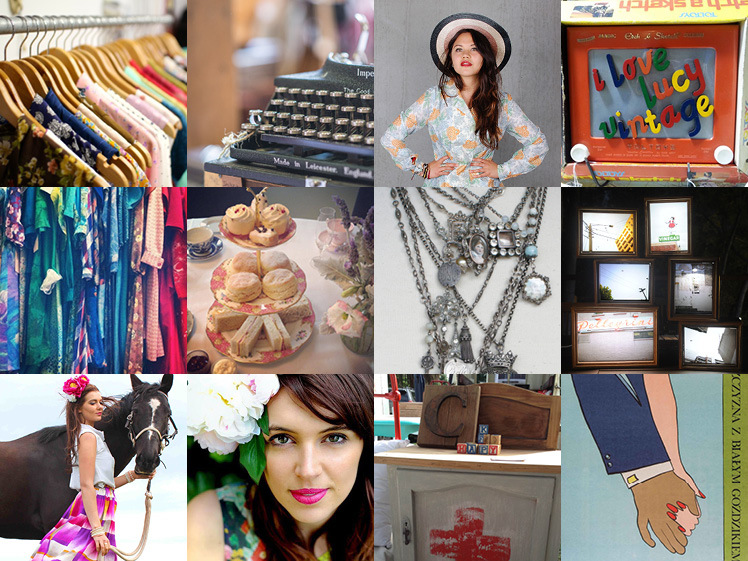 Based in Fitzroy, The Cavern Table will be bringing their best vintage pieces to the markets for you to enjoy. “The Eternal Headonist is here to dress your head in fabulousness! We sell beautiful vintage hats and headwear sourced from all over the World including New York, Chicago, London and Paris, and we love finding unique pieces from millinery greats of the past. Nothing pleases us more than finding the perfect hat for our customers and creating little moments of #hatmagic, so we can’t wait to meet you at the Finders Keepers market and play dress-ups with hats! We are vintage lovers and collectors who love to rock home interiors. Our style is eclectic we find kitsch, fun and quirky vintage pieces from all over the world so you can have that nostalgic feeling. Take a trip down memory lane with pieces like flying wall ducks, sixties floral suitcases and fun fondue sets – we love to make you smile. We are based online, The Finders Keepers Market is a chance to get face to face with our customers and have fun with a little pop-up store. I am a hunter, gatherer, seller, hirer and keeper of all things vintage. Vintage Influence is a vintage furniture, home wares and interiors business. I source original vintage items for the home and travel through the States, England and Europe to find my vintage treasures and bring them to Australia. I specialise in ‘vintage’ design or ‘vintage influenced’ design and in addition to sourcing I create furniture and soft furnishings with a vintage vibe. ‘Eclectic’, ‘Colourful’, ‘Quirky’ and ‘Fun’, four adjectives that describe me and the philosophy behind Vintage Influence perfectly.